Parking lot design is a snapshot of a civil engineer’s skill set, and the elements needed to be good at it are also the elements needed for good overall site engineering. It might seem rudimentary to some. But like anything else that is done well, it should be done with purpose. The parking lot is both a necessary part of our transportation system and a large cost of real estate development. 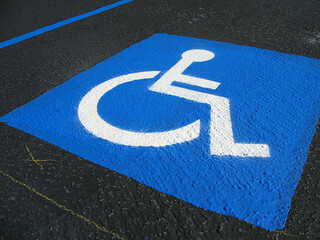 A parking area’s primary responsibility is to change drivers and passengers into pedestrians and back again. To keep costs down, parking lot design has to be practical from the start. 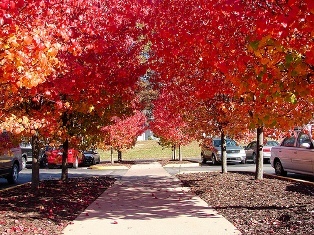 Designed properly, parking lots and facilities can also be aesthetically pleasing and environmentally sound. At first glance, a parking lot is simply an expanse of pavement. Good parking lot design, however, incorporates practical human needs with aesthetic considerations and environmental prudence. Note: We don't try to elevate parking lot design to a higher consciousness or something, it’s just that parking lots are expensive and permanent site fixtures and should be planned and designed with the same care as the buildings they serve. Drive lanes and parking stalls have to be sized and oriented correctly to allow easy driver navigation and vehicle passage. Pedestrians need safe and convenient passage to and from their vehicles. There’s no use making a parking lot environmentally sound and beautifully landscaped if it doesn’t work. That being said, good parking lot design incorporates aesthetics and environmental remedies with function in a way that keeps construction and maintenance costs reasonable. Parking lot lighting is required, unless the lot is gated to eliminate access at night, to provide safe use. It’s obvious that a properly illuminated parking facility enhances driver and pedestrian vision, and deters violence and theft. But the choice of lighting is important as well. Sodium and mercury vapor lighting (the orange and blue-white colored lights, respectively, usually used on public streets) illuminate in narrow bands of the visible light spectrum and therefore do not reveal colors well. Better choices are metal halide and LED lighting for color rendition. 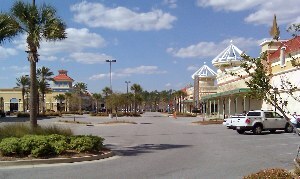 Apart from functionality, integration into the site is an important aspect of parking lot design. Using existing site features, landscape design, and integration of building architecture helps to both define and visually soften parking lots. A great opportunity for site integration is the incorporation of existing mature trees into the parking layout and design. To do this, the orientation of drives and parking stalls are configured to locate mature trees into parking islands and outside the pavement. 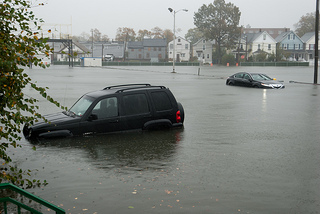 Parking lots produce much of the storm water runoff from a developed site. Local ordinances generally require that the peak runoff rate from a developed site not exceed the preexisting rate. Common law also finds that a property owner may not direct storm water onto an adjacent property in excess of preexisting drainage patterns. Additionally, some local governments require the reduction of pollutants in storm water runoff prior to discharge to surface waters or into a public storm water collection system. Don't let this happen to your parking lot. Reduction of the peak storm water runoff rate is accomplished by restricting the flow offsite. This requires that water be detained on the site, usually holding the storm water in the ubiquitous detention basin. If not designed carefully into the site, detention basins can be an eyesore. At sites where a natural look is desired, low areas of the site should be reserved for storm water detention. If a formal look or water features are desired, storm water detention can be incorporated into ponds and lakes. A storm water detention system that incorporates bioswales, rain gardens, and vegetated filters reduces pollutants, reduces peak flows, and just looks better. Using these natural systems uses more land because of the filtration area provided. At sites where the land available for parking lots is restricted, natural detention systems can be difficult, but not impossible, to implement. Based on the extent of green storm water and landscape buffer requirements, the parking lot design will need about 5 to 15 percent more area to implement all these features. Pavement absorbs the sun’s energy and releases it as heat. 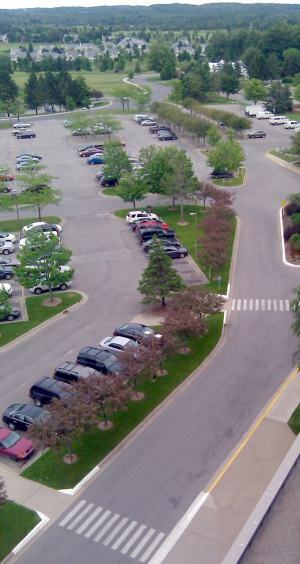 To reduce the heat island effect, parking lots should be shaded from the sun with boundary and internal arrangement of trees. Portland cement concrete pavement, being lighter colored than asphalt, will reflect more light and absorb less energy. Parking lots in northern climates need to facilitate snow plowing and snow storage. Curb cuts, or better yet, pavement edges without curbs, should be provided at ends of circulation lanes to allow snow plows to push snow away from parking areas without having to lift the blade. No matter how well they mark the curbs, plow drivers will hit and damage the curb! The search engines return a lot of ideas and images related to parking. 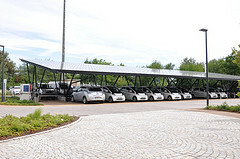 There are found “solar trees” for charging electric cars. These far-out concepts seemed to have a similar feature: To promote alternative energy use and reduce the parking lot carbon footprint. Efficient and less costly transportation is good. When the day for solar trees arrives, parking lot design will still have to incorporate practical solutions to driver and vehicle navigation, pedestrian safety, handicap accessibility, storm water runoff, and visual impact. Prince Engineering, PLC is a designer and engineer of successful land developments. I would like to talk to you, on me, about your development plan. Call me, Rick Prince, at (888) 418-2695 and see if Prince is a good fit for you. I think you’ll be glad you did. Send Rick Prince, owner and Engineering Principal, a message (This link takes you to the email contact form) or simply call for discussion and answers. We’re inclusive, not exclusive. That means engineering is done in a way that’s easy, understandable and productive. You’ll enjoy what you can build with Prince Engineering, PLC.